Let me upfront: I’m an unabashed free market capitalist. I’ve never been bothered by TV contracts, conference realignment, ticket prices, rising salaries for coaches and players, sponsorships and the multitude of other financial issues in pro and college sports that fans generally complain about at face value (but then turn around and feed that money monster by continuing to watch games). At the same time, I have long given up the delusional notion that college athletes (at least in football and basketball) are somehow still pure amateurs. We crossed the proverbial bridge of top college conferences being semipro leagues a loooooong time ago. 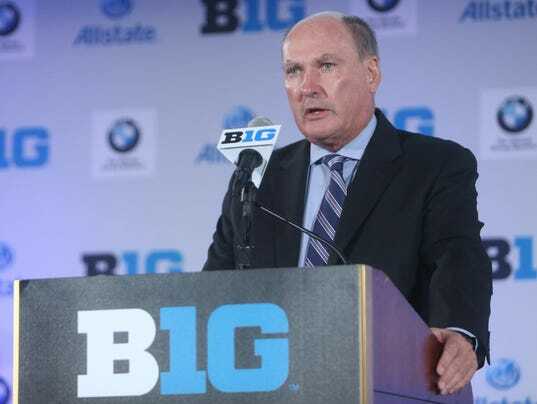 Finally, I’ve generally supported how Big Ten commissioner Jim Delany has led the conference in exploiting new revenue opportunities and expansion (as long as we can forget that whole “Legends” and “Leaders” debacle). So, I have no issue at all with money flowing through college sports and institutions profiting from high profile teams. Let’s stop pretending that it’s (a) not already happening at a rate on par with the pro leagues and (b) inherently a bad thing. What I have a massive problem with, though, is that this money isn’t flowing at all to the people that are generating all of this revenue. I’m a firm believer that people should be compensated in accordance with their free market value*, and in today’s world, college football and basketball players at the top level aren’t getting paid that way. (1) The Interests of the NFL and NBA Ultimately Rule – The power brokers in college sports can complain all that they want, but the NFL and NBA need to be convinced that it’s better for them to pay for and build minor league systems on the scale of Major League Baseball. I’ve seen plenty of arguments that the NFL and NBA could expand create such systems, yet it’s hard to see why it’s better than the current college model from their perspective. Unlike baseball, the NFL and especially NBA have long had a greater need for their athletes to come into the league as ready-made stars and that’s only exacerbated in this social media-driven world. Such star power simply isn’t incubated well in minor league settings at all (as seen in baseball and hockey). College football and basketball provide vehicles where sports fans are introduced to top players on a first name basis and can step in immediately at the next level. (2) Players Need to be Protected From Themselves – On the one hand, it would be easy for a free marketer like me to try to apply real world concepts to the realm of sports to state that players and team general managers take risks with respect to the draft and then they need to live with the consequences. However, on the other other hand, that real world free market application fails because a draft is specifically not the free market. In fact, it is probably the most directly anticompetitive behavior that professional sports league participate in that they’re only able to get away with due to antitrust exemptions. American high school graduates aren’t free to negotiate directly with any team that they want to play for. Instead, a draft provides a finite number of spots in a predetermined order, which is the antithesis of a free market. This means a “college or pro” choice isn’t exactly that simple. What Delany is suggesting is that a top high school prospect should be put into an “all or nothing” decision when he’s 17 or 18-years old: either he strikes it big in the pros or he completely loses out on a college scholarship, with very little in between. There are very few professions where this is the case. A software programming prodigy can try going to a startup firm out of high school, but if that startup fails, he or she can still go get a computer science degree or work at another company. That’s not how it works in football and basketball where you have one shot if you’re lucky. How many of you here would have had the emotional and fiscal maturity to make that type of decision at that age? Furthermore, how many of you would be able to make a mature decision if you were born into an impoverished environment with no access to a college education otherwise (like a disproportionate number of top football and basketball players)? What if you had family members that were leaning on you for financial support? What if you hired an agent that invariably overinflates your draft value (which played into your decision to enter to the draft)? When I see comments from fans to the effect, “These are decisions that these guys need to live with and they can do something other than sports if they don’t get drafted,” I believe they’re failing to see the context in which such decisions are made along with, in most cases, making that judgment from comparatively more comfortable catbird seats (whether it’s being older or living in a middle or upper class environment where the fallout from making a mistake in life is relatively mild by comparison). (3) The NCAA Needs to Provide a Safety Net for Players – If the NCAA sincerely believes that high school players need to be able to go directly to the draft, then the organization can’t turn around and punish such players (AKA taking away their college eligibility) for utilizing all of the tools and resources at their disposal to make a fully informed decision that will impact them for the rest of their lives. Jim Delany mentions players hiring agents and training firms like IMG, which is all well and good, but then the NCAA will take away their eligibility once they receive any agent benefits. A solid and reputable agent (not a guy off the street or, even worse, an emotionally invested family member) can probably give a player the most realistic analysis of anyone about draft position and long-term earning potential, yet the NCAA (via its rules regarding agents) is forcing athletes to make an all-or-nothing decision on eligibility before he can even receive that analysis. That’s not exactly equitable, particularly when the athletes are the ones in a much more vulnerable position compared to the NCAA and its members. If you were to plop down those figures in front of anyone that has the basic skill of knowing which number is higher, one would logically assume that the team with Budget A has a lot more money to pay players than the Budget B team. Well, Budget A represents the expenses of the Ohio State athletic department in 2012. Meanwhile, Budget B represents what used to be the annual operating cost of each individual team in the defunct NFL Europe, which was the minor league system that the NFL had run until 2007. A major difference on top of this disparity is that Ohio State brought in $142,043,057 in revenue (a profit of over $17.6 million). Meanwhile, NFL Europe was shut down since it was still losing money at the bare bones cost of $500,000 per team (which translated into a grand total of $3 million in costs for the entire 6-team league in 2007). To put this into context, the NFL minimum salary under the current collective bargaining agreement is $405,000. The last 8 bench players on the Bears’ depth chart make more than what was spent on the entire NFL Europe operation… and the NFL still lost money on it! Call me crazy, but when Jim Delany states that the players should be going to minor leagues to get paid, he seems to have the money flow backwards. When the NFL itself isn’t willing to spend to fund an entire minor league system that costs less than the salaries of 8 bench players making the league minimum, you can see pretty clearly that the money isn’t there. The NBA D-League is run on a similarly shoestring budget. In contrast, the colleges are the ones seeing a massive revenue flow off of these young players, so it’s disingenuous of university leaders and conference commissioners to attempt to make the claim that the minors are where they ought to receive salaries. Texas A&M itself stated that it garnered $37 million worth of media exposure in connection with Johnny Manziel’s Heisman campaign last year, so one can imagine the financial impact of a national championship (or even better, the Heisman Trophy/National Championship combo that Cam Newton delivered to Auburn in 2010 – see Charles Barkley’s comments about how $200,000 that may or may not have been paid to Cam by boosters was a bargain) for a school. So, sure, if colleges are willing to take reduced or no revenue for football and basketball in the same way that they are for baseball (where even the most elite programs make a fraction of their football and basketball counterparts), then I could see this argument from Delany sticking. However, let’s not be naive to think that there is a vastly different playing field for football and basketball in reality. Now, I realize that there are Title IX, employment and other issues that come into play in the event that colleges start paying athletes. It’s not as easy to institute as most supporters of the concept would like it to be. However, that doesn’t mean that we should allow colleges (even if we love them as our alma maters) to get away with such blatant hypocrisy toward money. It’s time to ditch the faux amateurism and either go all in on college sports being a massive money-making enterprise or take a Division III approach. If that means paying every athlete (from members of the football team down to the women’s water polo team) in order to comply with Title IX, then that’s a heck of a lot better than not paying anyone. Once again, I have no issue with the money flowing through college sports at all. The only thing that I want to see is that it flows down to the people that we’re actually cheering for as fans. Very interesting question. I think that A&M’s success can definitely impact the long-term prospects of Texas, but that it’s a separate issue from the particular conference that UT is in (or if it’s an independent, not in). A lot of sports fans may be looking at the Big 12 through the prism of its relatively good on-the-field football success over the past few years, while the ACC has had arguably its weakest stretch over the exact same period. However, I’d argue that Florida State, Miami, Virginia Tech and Clemson at the very least are more valuable football opponents than any Big 12 school outside of Oklahoma. Personally, I’d put UNC, NC State and Georgia Tech ahead of anyone non-OU Big 12 school purely for football, as well. So, if Texas keeps the Red River Rivalry as an independent, plays 1 or 2 of its fellow in-state Texas schools not named Texas A&M, has a similar 5-game partial ACC schedule like ND and then fills out the rest of its schedule in a manner that’s similar to now, I think that’s very attractive compared to the normal Big 12 schedule for the long-term. We’re not even getting to basketball and baseball, where the ACC is extremely powerful. So, A&M could certainly put a serious dent in UT’s power (and if it’s not A&M specifically, it could be simply the increased presence of the SEC in the state of Texas), but that doesn’t necessarily correlate in Texas preferring the Big 12 over partial membership in the ACC. If anything, Texas might end up with acting in a way similar to how BYU responded to Utah’s invite to the Pac-12, where independence became mechanism to show how it was “special” compared to its in-state rival. To me, Big East expansion to 12 schools is inevitable and ought to have happened already. The fact that Xavier AD Greg Christopher mentioned St. Louis, Dayton, Richmond and VCU as the prime candidates isn’t any surprise. SLU seems to be a lock – it’s a perfect institutional fit in a large market (by college sports standards) with a competent on-the-court basketball team. As I’ve stated previously, it’s really a matter of who comes along with SLU. I don’t see the Big East being interested in creating a nationwide conference with schools like Gonzaga and BYU – that’s an interesting fantasy for those purely focused on the basketball product, but it’s a non-starter for all of the other sports. So, Dayton, Richmond and VCU are really the well-worn “other” candidates, with the Big East’s consternation on each of them being that they have major flaws from the conference’s perspective (Dayton is in a smaller Midwestern market, Richmond has a small alumni base, and VCU would be the lone public school in a league of private institutions). It’s also difficult to see many other schools outside of that group that could have both a Butler-like ascent and the institutional and market profiles that the Big East is looking for. The only ones that come to mind are Davidson (which has a small size like Richmond but has had more recent on-the-court success and is located in a college hoops hotbed) and Duquesne (great institutional and market fit, yet they have zero on-the-court credentials). If I were running the Big East, I certainly wouldn’t see Davidson or Duquesne as panaceas that are worth holding off expansion for. University presidents have proven to be a strange bunch in conference realignment decisions, though. To me, SLU is a lock to get into the Big East when it expands (and I say when because I just don’t see Fox being satisfied with the level of inventory and market coverage that the 10-team setup offers in the long-term), with Dayton as a slight front-runner for the 12th spot. Now, VCU might end up being too much to ignore if they have another Final Four run and, maybe more importantly, keep having fans showing up in droves in Brooklyn for the Atlantic 10 Tournament (as the Big East needs to maintain ticket buyers for its own tournament at Madison Square Garden). The public school profile is definitely a major problem for VCU’s candidacy, though. That factor can’t be underestimated with the Big East presidents. For the long-term (the next 10 to 20 years), it probably won’t look too much different than now when it comes to U.S. spectator sports: (1) football, (2) basketball, (3) baseball and then a big dropoff to get to hockey and soccer. (This is different than levels of actual participation in sports, where soccer and basketball will likely dominate.) When looking at the metrics, basketball is clearly ascendant compared to baseball: the NBA Finals have been consistently drawing better ratings than the World Series, NBA players are more recognizable to the general public, neutral sports fans are more likely to watch an NBA game that doesn’t involve their favorite team than an MLB game without their favorite team, and, most importantly, the NBA viewing audience is younger and more diverse across economic and racial lines. I wrote a piece on soccer’s issues with viewership back when David Beckham joined the LA Galaxy a few years ago and the main thrust of that post still holds true: viewership of soccer in the U.S. will be capped as long as Major League Soccer fails to import the best players in their primes like they do in Major League Baseball, the NBA and NHL. Americans want to watch the best of the best, which is why they’re willing to watch the U.S. Men’s and Women’s National Teams play in the World Cup and other international competitions, but aren’t interested in what they perceive to be minor league pro soccer compared to the English Premier League and other top European leagues. Think of it this way: most sports fans can recognize the difference in the quality of play between an MLB game with a 1-0 score and a minor league baseball game with the same 1-0 score. Likewise, even relative soccer watching novices in America can see that the level of play in a World Cup or EPL match is vastly different than MLS. That’s why I’ve long said that the drag on soccer’s popularity in the U.S. has nothing to do with the supposed lack of scoring*. Instead, it’s that soccer is the main sport where we’re exporting the best players as opposed to importing them, which means we’re getting a worse product than other countries (unlike in basketball, baseball and soccer) and we know it. So, soccer can grow, but it will be limited as long as we don’t get to watch the best players here. Ah, yes. Yet another toothless action by the NCAA and conferences in attempting to deflect criticism that they’re taking in billions of dollars on par with the largest pro sports entities in the world. I guess the NCAA has a bit more skin in the game since its brand is in the title of the game itself, but it’s pointless for the conferences to remove their names from video games, but then allow their members to continue to be included under their own separate agreements with EA Sports (and all but one of them have such agreements). We’re not talking about going to some Blades of Steel era logoless and nicknameless labeling of teams here: the Illinois Fighting Illini, Michigan Wolverines, Ohio State Buckeyes and all of their other conference-mates will be playing in a video game league that’s not named the Big Ten but everyone will recognize is the Big Ten. (I’m sure that EA Sports will simply use the mathematically correct “Big 14”.) Why the Big Ten, SEC and other power conferences give up their branding control when their member schools are still participating in the game is beyond me. @frankthetank111 Is their battle btween Espn&Fox driving expansion & realignment? If so? who has advantage? How do U see it playing out? I don’t think ESPN and Fox are battling over conference realignment per se in the sense that the only conference where it really matters at this point for them is the Big Ten. In fact, the Big Ten’s next TV contract (which would start in 2016) is in an environment where it’s the only power conference that’s going out to the open market for the next decade, so ESPN and Fox (along with NBC and maybe even Turner) could fight for the conference with realignment being a tangential factor. At the end of the day, I believe that the Big Ten will end up with a Pac-12-style deal where the Tier 1/Top Tier 2 rights are split between ESPN and Fox and then the Lower Tier 2/Tier 3 rights go to the Fox-affiliated BTN, so neither ESPN nor Fox will push the Big Ten or the other conferences to do one thing or the other simply for the sake of TV rights. If anything, the last thing that ESPN and Fox would want is further realignment, as it has resulted in significantly higher rights fees that they’re footing the bill for. The Pac-12, Big 12, SEC and ACC rights are all locked up for a long time, so the networks are just going to end up paying more if any other schools end up defecting to the Big Ten. (2) The top 4 U.S. pro sports leagues will NEVER contract – Believe me – if I could wave a magic wand, there would be 8 to 10 NHL franchises eradicated tomorrow. However, when franchise values for even the worst pro teams in the worst markets are worth hundreds of millions of dollars, owners would rather (a) collect entry fees from new buyers of those dog franchises, (b) move those dog franchises to new markets with “acceptable” stadiums and (c) simultaneously scare current markets into building new “acceptable” stadiums in the process. So, the first question is fairly straightforward at a high level – the greater likelihood for the NHL is expansion simply because contraction isn’t a viable option. That being said, when you dig down deeper, how much is it worth for any league to expand at this point? Most NBA and NHL franchises are better off using Seattle as a threat to current markets within their footprints to ram through new stadium deals than putting a team in Seattle itself. Leading into your next question, the NFL has used this type of threat better than anyone with the lack of a franchise in Los Angeles. Think about it if you’re Jacksonville, St. Louis or San Diego – if the NFL won’t put a team in LA for not having an “acceptable” stadium, then they sure as hell won’t care about you if you don’t have the right building. The team that should move to LA is the Jaguars (nothing against Jacksonville, but it truly doesn’t make sense how that market has an NFL franchise), but it appears that their stadium lease is extremely difficult to break. That leaves LA’s two prodigal sons of the Rams and Raiders as frontrunners (franchises with aging stadiums and relatively low contractual barriers to deal with) along with the Chargers (a fairly short geographical move). Of course, remember point #1: LA must have an “acceptable” stadium. That has always been the dilemma. The proposed Farmers Field in downtown LA near the Staples Center and LA Live had always made the most sense to me from afar since it presents the best opportunity to be a catalyst to further economic development in that area. Downtown LA still isn’t anywhere near as walkable as New York City, Chicago or San Francisco, but a football stadium is a logical addition to what the LA Live complex has already brought there. Unfortunately, that proposal seems to be dead right now. The problem is that the massive size of the LA market almost works against it in an environment where getting the right stadium deal matters more than anything else in attracting an NFL (or any other pro sports) franchise. The LA market is so lucrative that tons of potential high profile investors want to get into the action, which means that the region as a hole continuously fails to coalesce around a single stadium proposal. The City of Industry and Orange County, for example, see Downtown LA as a competitive threat as opposed to a partner, so we’ve been seeing lots of stadium proposals from various municipalities and factions over the past two decades without any of them getting broad support. In contrast, smaller markets have a better ability to get behind a single proposal with little infighting. I’ve been thinking that LA would have an NFL team within the next 5 years for the past 15 years, so while it makes sense to virtually everyone with half a brain, it’s pretty obvious that the NFL won’t budge whatsoever on the stadium issue even with a gaping hole in the #2 TV market in the country. Roger Goodell would rather work with markets that have top tier stadiums in place… like London*. Enjoy the upcoming games, everyone! Frank the Tank Mailbag: Part I – I’m Not in the Realignment Business. I’m in the Empire Business. @frankthetank111 if a division 4 does come to pass would and MWC and aac are invited to the party does that improve their TV prospects? @frankthetank111 it seems like the power 5 confs are going to break off from the NCAA soon since they announced it – do you agree and when? My overarching thought on the impact of the proposed Division 4* is (going along with the Breaking Bad theme) that there won’t be any “half-measures”. On the conservative end, this could be a straight-forward exercise for the football schools to get more leverage in rule-making (which is what Big Ten commissioner Jim Delany has intimated). Contrary to popular belief, the vast majority of FBS schools (from the SEC down to the Sun Belt) have been in favor of instituting full cost of attendance payments to athletes, whereas the main opposition has come from non-FBS Division I schools. If the impetus behind creating a Division 4 is to simply get more control over the NCAA governance process, then that suggests that all FBS conferences will end up in that top division. Jeremy Fowler of CBSSports.com has reported that that this is what NCAA faculty representatives are essentially recommending. On the other end of the spectrum, Division 4 could truly be the formal separation of the 5 power conferences plus Notre Dame (no matter what you think of the Irish, you have to always include Notre Dame) so that there could be more radical changes down the road. Maybe there could be payments to players beyond the full cost of attendance. Maybe athletes will be allowed to auction off their autographs on ebay. Probably most intriguing (and what I think is the long-range goal) is that this is all about setting up an 8-team playoff with the 5 power conference champs with auto-bids and 3 at-large bids without having to deal with the “riff raff” of the Group of Five leagues (and protecting the power leagues from any legal challenges to that playoff system on top of that). Imagine a playoff with a traditional Rose Bowl (Big Ten champ vs. Pac-12 champ) plus the Sugar Bowl (SEC champ vs. at-large), Orange Bowl (ACC champ vs. at-large) and Cotton or Fiesta Bowl (Big 12 champ vs. at-large) as quarterfinals. The ratings and money would be through the roof along with supercharging the interest in the regular seasons of all of those power conferences (meaning even more ratings and money) and they get to control all of it without having to share with the revenue takers. That can be done with a totally separate Division 4 in a way that probably can’t occur in the current NCAA structure.
.@frankthetank111 Would a Div 4 breakaway be possible with some existing group of conferences w/ NO realignment of those conferences? I can now answer this question nicely since we had a successful “Hate Cincinnati” weekend in the Frank the Tank household (Illini over Bearcats on Saturday, which frankly shocked the hell out of me, and Bears over Bengals on Sunday). Cincinnati and its AAC/old Big East zombie counterpart UConn are definitely power conference material on paper. The issue is more about whether any of the power conferences will see a need to expand proactively while everyone other than the SEC is at the start of long-term grant of rights agreements that make it difficult (if not impossible) for power schools to move amongst themselves. Overall, the Big 12 is more likely to want to expand at some point because of their small size, poor demographics outside of the state of Texas and the fact that IF a grant of rights agreement were to be broken (a massively large IF), it would be in the context of the Big Ten raiding the Big 12 again (more on that in a moment), which would bode well for Cincinnati. The Bearcats have a solid football program in a good TV market with access to a great recruiting area for athletes of all types (whether football or basketball) while also providing a geographic bridge to West Virginia for the Big 12. As a result, Cincinnati is likely next in line for the Big 12 (alongside BYU) if that league wants to expand. The problem for Cincy fans, of course, is no one knows if or when that expansion would happen in the near future. The ACC would probably favor UConn over Cincinnati if it had to choose, although that conference did deviate from its traditional criteria in choosing Louisville last year. The main issue for any school with hopes of joining the ACC is that it doesn’t seem plausible that it would expand outside of either (a) backfilling in the event of a raid by the Big Ten and/or SEC or (b) pairing a school with Notre Dame joining as a full member, neither of which seems to be on the horizon in the short-term. There’s at least some argument that the Big 12 would proactively expand regardless of what the other conferences do, so that at least gives Cincinnati some hope. @frankthetank111 thoughts on next B1G move please? @frankthetank111 I am an OU fan. Any chance we are headed your way? @frankthetank111 is the #B1G trying to surround the new #SEC markets in #KC and #StLouis? Let’s start with my previous post, where I point out how difficult and unlikely it is to break a grant of rights arrangement over the next decade or so. As a result, the likelihood of Big Ten expansion in the near future is extremely low, as I don’t believe that the conference is interested in anyone that isn’t already in one of the 5 power conferences (meaning no one in the AAC or any other Group of 5 conference is compelling enough). Putting aside the obvious no-brainer additions like Texas, I’m firmly in camp of supporting the addition Oklahoma to the Big Ten and I don’t believe that it’s a purely fan-focused football move. The main detraction for Oklahoma that I often see is that it isn’t an AAU member, but its academic metrics aren’t really far off at all from now-non-AAU member Nebraska and its neighboring old Big 8 AAU schools (Missouri, Kansas and Iowa State). There isn’t the wide academic gap between OU and Nebraska that there was in the case of Louisville compared to the rest of the ACC. Some Big Ten observers believe that the non-AAU status of Oklahoma is a non-starter, but I doubt that the conference would have engaged performing due diligence on the Sooners unless there was some legit interest involved. More importantly, the lack of AAU status for other expansion candidates was simply another reason on top of a number of other factors that made the target school undesirable (i.e. geography, lack of a fan base, lack of a football brand name, not a new TV market, etc.). It’s easy for the Big Ten to ignore a merely “good” football program based on academics (i.e. West Virginia or Louisville), but Oklahoma is a top level king school that would bring a ton of national TV dollars. Even Oklahoma’s smaller home state population on paper is mitigated by the fact that its fan base crosses over into North Texas and the Dallas-Fort Worth area (and Kansas, by the same token, can’t just be looked at by its home state population alone since it’s the top college team in the Kansas City market that takes a large chunk of Missouri). The upshot is that if the Big Ten goes to 16 schools, then the last 2 additions actually need to make markets irrelevant. What are the 2 additions that can truly transform the BTN from a regional network to a legit national network? Sure, if the Big Ten has the choice, they’d want Texas and Notre Dame (or some other unattainable major market prize like North Carolina or Florida). However, if we’re talking about the top brand names that are willing to reciprocate the Big Ten’s overtures, Oklahoma and Kansas are sitting right there to supercharge the conferences’ football and basketball lineups, respectively. Penetrating a diverse market like New York City has as much to do with the national interest in various teams as it does with local interest, which aids the cases of OU and KU. Frankly, the biggest factor working the Big Ten going after either OU and KU (much more than academic concerns) is the political pressure of those schools’ respective in-state brothers (Oklahoma State and Kansas State). I believe the Big Ten would expand with an OU/KU combo, but the conference won’t be willing to take either Oklahoma State and Kansas State in the process. Those “little brother” schools might be non-negotiable from a political perspective even if Jayhawk and Sooner fans don’t want to believe that to be the case, so that could stop Big Ten expansion regardless of any Big 12 grant of rights concerns. So, that brings me back to my initial point that Big Ten expansion isn’t likely, albeit it’s still fun to talk about after all of this time. I’ll be back with Part II of the mailbag going over issues such as EA Sports NCAA ’14, Big East expansion and pro sports realignment shortly. Talk to you again soon!